Giant Elephant Games (with the go ahead of creator David Firth) has resurrected Salad Fingers, that unsettling mid-aught staple of the internet. The new Salad Fingers: Where's May Gone is a point and click adventure, whose first of three acts is currently available for free. After watching the trailer I'm fairly confident that Giant Elephant Games ripped their concept for Where's May Gone straight out of a nightmare I had after falling asleep in front of my PC while browsing though Newgrounds some late evening years ago. Where's May Gone is set in the barren post "Great War" world where Salad Fingers makes his home. 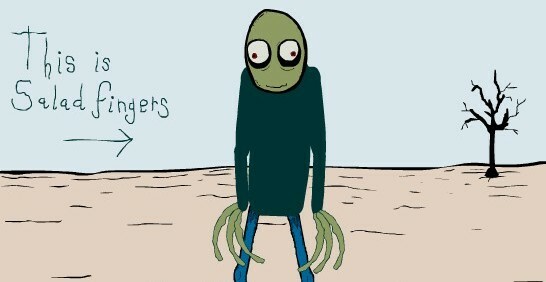 Having survived the war you awaken to discover you are being held captive by Salad Fingers. The game features some familiar characters and seems to run parallel to the episode's stories. If I had dared to imagine a Salad Fingers game, it would've probably be something like this. The art style in WMG is perfectly in line with the crudely depicted horrors of the original Flash series, the only downside I have found so far is that David Firth's iconic voicing of Salad Fingers is missing. I do wish that Giant Elephant Games had managed to sit Firth down in front of a mic for a bit during whatever blood ceremony they had to do to get his blessing.